Because of my background with the Christian church and my laymen’s knowledge of the Bible, my wife and daughter — who attend a local Protestant church — often ask me to explain various Biblical verses. But starting from when my daughter was a young child I attempted to tell her all angles of a passage whenever I could. For example, if she asked about baptism, I would, to the best of my ability explain what the various churches taught on the subject. Whether this was the best approach, she’ll decide as she ages, but it was my attempt to let her find her own truth. That being said, both my wife and daughter have asked me on multiple occasions how the Bible came to be. I struggled with a method of explaining that although some believe “God spoke it” and it just appeared, the history is not quite that simplistic. I finally found a succinct (less than 100 pages), interesting book published posthumously by a United Methodist minister that explains the history of the Bible in an enjoyable, understandable way — giving just enough of the process to move the story forward without burdening the reader with all the intricate details of how each translation came into existence. How the Bible Was Built starts with the discovery of the first Old Testament text — Deuteronomy — and ends with the various modern translations that exist. As the authors explain not all Old Testament books were considered Holy Scriptures by Jews, in fact, they explain, for some Jews (and quite possibly Jesus), the Old Testament consisted of only the first five books of the modern Bible. As far as the New Testament, the authors say that by about 200 A.D. a list of books considered Holy Scripture had been compiled. And the first complete manuscript of the New Testament discovered — The Sinaitic Manuscript — closely mirrors the modern New Testament with the exception that the Sinaitic Manuscript contains two additional books: The Shepherd of Hermes and the Letter of Barnabas. But What About Those Pesky Books Between The Old And New Testaments? What the authors accurately point out is in many of the original manuscripts — including the original King James Version — were 15 books collectively known as the Apocrypha. (The pulpit Bible at the church I grew up in contained these books.) Although most Protestants eventually dismissed these books, the Catholic church still recognizes 12 of them as Holy Scripture. When the KJV was first published, printers who removed the Apocrypha from the text were subject to heavy fines and jail time because King James was adamant that the books belonged inside the Bible. However, by the mid-1800s, the books were eventually removed from most — and basically all American — versions of the King James Bible as reformers contended that originally these books were seen more as holy works and not as holy scripture. What Did People Read Before The King James Version? 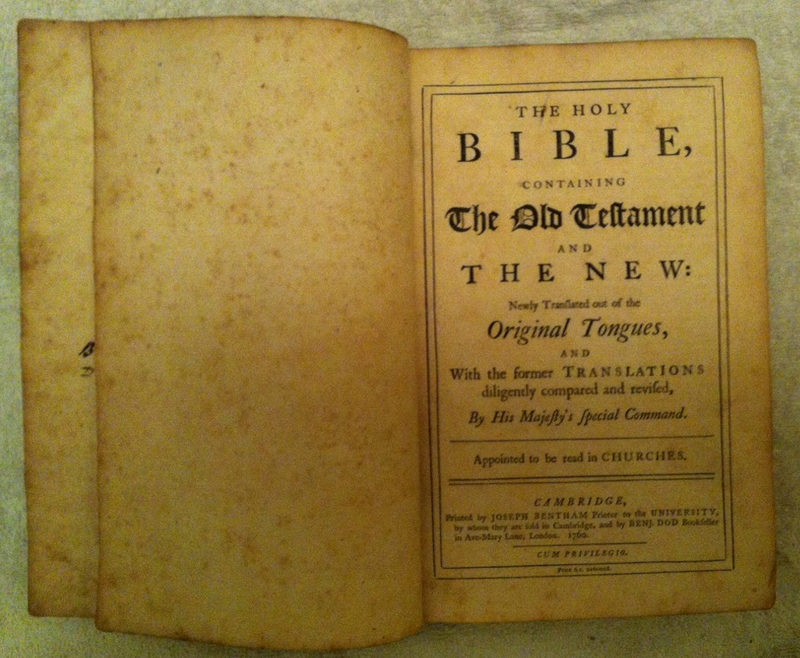 Coverdale Bible, published in 1535, was the first complete English Bible. According to the authors, the debate over which books belonged in the Bible changed over the course of about 1000 years. As they note, The Shepherd of Hermes almost made it in while the Revelation of John barely made the cut. But the end-all event that defined what books would or would not be included in the Bible was the invention of the printing press. Once Bibles were printed, it effectively ended the debate. On the third day thou didst command the waters to be gathered together in the seventh part of the earth; six parts thou didst dry up and keep so that some of them might be planted and cultivated and be of service before thee. Columbus surmised after reading this passage that since the earth was only 1/7th water a trip from Europe to Asia would be relatively short.